Operators at fifteen workstations call for correct size "caul plates" and stainless steel separator plates to build up several circuit boards. 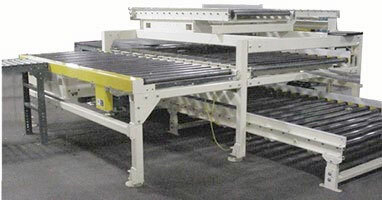 Afterward, the finished assembly is sent out of the system to a press which presses and heats the assembly into several large blank printed circuit boards. This is a three tier system. 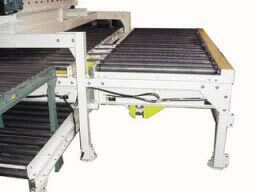 Product is loaded and accumulated on top level, transferred to operator and finished on middle line, and sent out of the system to the press area on the bottom level. Transfers are all Intralox plastic knuckle chain. Workstations are all special low-chainguard Model CRR. CRR sections are all individually driven. Accumulation is controlled by the customer. All drives have individual speed controls built into the motor.